You are a lover of gorgeous landscapes and fine wine and seek experiences that combine views and viticulture. Geology intrigues you and so do indigenous cultures. Our exclusive pairing of a travel photography tour and the high-altitude wines of Northwest Argentina, expertly guided by renowned photographer Ossian Lindholm. Join renowned Argentine photographer, teacher, and documentary filmmaker, Ossian Lindholm, on the world’s only photography tour to be paired to an exploration of the high-altitude wines of Northwest Argentina—a magical journey that is perfect for photographers of all levels. An exceptional and inspirational teacher, Ossian is dedicated to capturing, conserving, and sustaining the landscape, nature, and culture of Argentina—all through his passion for photography. One of South America’s finest photo journalists and artists, during your unique photography adventure Ossian will be sharing the secrets of his art—explaining how to capture the special light, angles, and colors of this enormously photogenic and pristine region. In addition to his hands-on instruction, Ossian will immerse you in his extensive knowledge of the region’s geography, wildlife, cuisine, and culture. By day we will follow a carefully planned route, with daily hikes among one of the world’s most peaceful and diverse landscapes. Our evenings on this dream photo tour will be spent in interactive photo skill sessions and photography reviews with Ossian—accompanied, of course, by the world’s finest high-altitude wines. Stunning sights and subtle magic are the focus of this photography adventure, which ranges across diverse landscapes. Our itinerary, designed by Ossian, spans the five distinctive biomes of Northwest Argentina: the sub-Andean humid sierras of the east; the fertile valleys, the canyons, and the high mountains of the Andes; and the high plateau of the Altiplano, or Puna. The highest vineyards in the world thrive here, bearing grapes that will become elegant, fruity white Torrontes, or full-bodied red Malbec wines. The temperate valleys, where cattle and farming sustain life, have spawned a strong gaucho culture too—something you will experience and photograph up-close. We’ll tour the world’s highest vineyard, at Colome, see (by special invitation) the James Turrell museum, tour the magical town of Cachi, and explore Los Cardones National Park and the Quebrada de Humahuaca, a World Heritage Site. You’re sure to capture the visual essence of each, and also to have their soulful beauty revealed, on our extraordinary high-altitude wine and photography tour! 2015 National Geographic Traveler "50 Tours of a Lifetime." A special aspect of this tour is the experience of the Gaucho culture and traditional music and dance that defines northern Argentine folklore. The Argentine folklore dates back to the 1500s when Spanish colonial forces ruled the lands. Often referred to as criolla, the customs are an eclectic mix of European and indigenous heritage which have morphed into a new fascinating subculture. 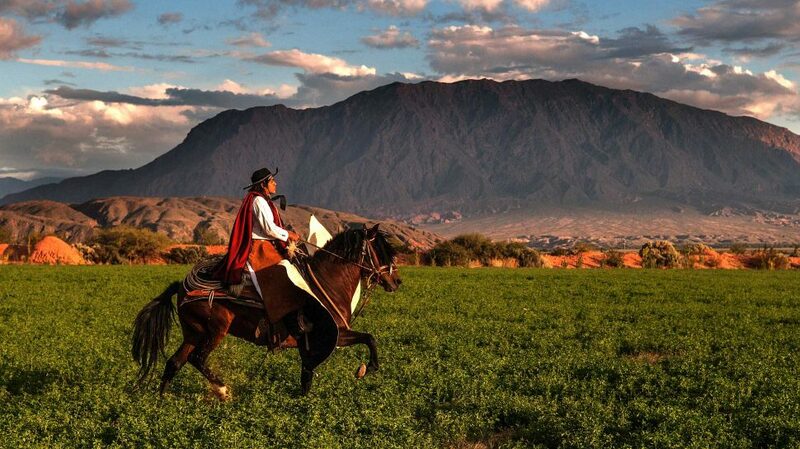 Center to folklore culture is the guacho, a hardy Argentine cowboy who has traditionally lived off the land. The gaucho is something of an idolized folk hero in the north. He is a figure that everyday citizens aspire to become. A source of cultural pride. On our last night we experience an Argentine peña that revolves around four essential themes – music, dance, food and drink – all of which are enjoyed in abundance. Morning departure will be from Villa Vicuna (pre-night hotel). We’ll stop for lunch at a goat farm, just after the small village of Talapampa. We aim to arrive at our hotel by early evening, relaxed, satiated and inspired. After a rest, we’ll gather together for cocktails and enjoy an introductory talk by Ossian about the region, as well as the important role that photography plays in protecting and conserving its natural and cultural treasures. Dinner will be at the Patios de Cafayate’s lovely restaurant. A country mansion with elegant dark wood furniture and red- tiled floors and river views. The hotel rooms overlook the courtyards, gardens, vineyards and mountains surrounding the Valley Calchaquí. Amenities include hairdryer, minibar, and Wi-Fi. There is an outdoor pool and the restaurant serves quality cuisine. We’ll begin the morning’s photo safari with a sunrise hike to La Punilla, hoping to capture the first light over the Calchaquí Valley. After breakfast, we’ll gather at our hotel for our first Powerpoint photography lecture. Afterwards we will explore the Piatelli vineyards, enjoying a traditional lunch in their delightful restaurant. In late afternoon we will head to the tiny village of Cafayate, known for its wine museum and lively plaza. An early rise will ensure the dunes at sunrise will await your camera lens (and creative eye) on our third day in Cafayate. After breakfast, we will have another creative Powerpoint lesson in photography. We then plan to have a multi-course asado (an Argentinian BBQ) in Estancia Chimpa, to be followed by some intriguing folkoric surprises. In the late afternoon, when the light is at its most perfect, we’ll hike into La Yesera to photograph this magnificent ancient canyon. Before dinner, we will stroll back through the village of Cafayate, where you can purchase traditional handicrafts. On the fourth day of our Argentine photography tour it will be time to leave Cafayate, heading north along the famous National Route 40, the backbone of the Calchaquí Valley. You can hopefully make the most of the early morning light, as it paints La Quebrada de Las Flechas (the Gorge of Arrows). Around midday we will have a family farmhouse lunch at Finca del Carmine, which overlooks a truly spectacular valley. We plan to drive through a section of this road, called Route of the Artisans, and stop at the quiet village of Seclantás. This is the spiritual home of the Salta poncho. A stop at the home of Senor Tero is particularly noteworthy—he wove a poncho that was worn by Pope John Paul II. By the day’s end we will arrive at Cachi, spending the night in Hotel La Merced del Alto. Set in the Calchaqui valleys, just 2km from the historic town of Cachi. The hotel has breathtaking views of the surrounding hills, rivers, and streams. Enjoy an outdoor swimming pool, terrace, restaurant and wine cellar, and full spa. Your photography adventures continue on day five, as we take an early morning hike to an Inca settlement at base of the Cachi Massif. Here you can to practice composition, aperture settings and shutter speed. Ossian will also share his knowledge of the Inca’s sophisticated irrigation systems. These are still evident in the terraced hillsides here, which are covered in many different types of cactus. We hope to get our lenses right down to earth here, so you can photograph the striking native flora and fauna. The highlights of this village include the Cachi Church and the Cachi Archeological Museum, where we will spend the afternoon. After dinner, we will gather for a special session in night photography and will see if we can capture the moon as it rises over the Cachi mountains. Today we will first seek out the myriad of contrasting colors in the Valle Encantado (Enchanted Valley), with its astounding erosion-sculpted rock formations, as well as exploring wider the National Park Los Cardones. From Valle Encantado we will descend down the Cuesta del Obispo, a winding road noted for its many micro-climates, connecting the arid climate of the highlands with a mountain forest. We will have a picnic along the river and then drive to Purmamarca in the Jujuy region. 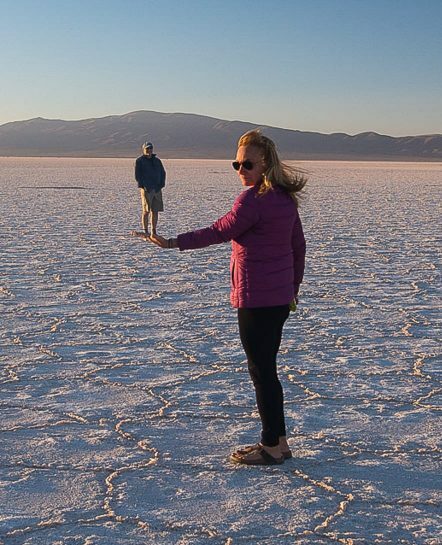 This is one day on your Argentina adventure tour sure to be full of special photographic moments! Located in the beautiful Purmamarca, La Comarca has unique architectural style that is inspired by the landscape and culture of the region. It also has a roof terrace and veranda overlooking the valley and the hills that surround it. Today will be another lesson in light for you, as we will practically be on the Tropic of Capricorn, and so bathed in vertical sunlight at midday. In the morning we plan to walk through the Pucará de Tilcara, a pre-Inca fortification which is located on a hill just outside the small town of Tilcara. You will have time to peruse the town’s markets later, where we will also have lunch. Then we will take a very special sunset drive to Las Salinas Grandes, a huge expanse of salt that simply defies perspective and distance. By the day’s end we will arrive at Quebrada de Humahuaca: here we will stay for the night in a local hotel. (the Seven Colors Mountain), famed as one of the most beautiful and famous hikes in Northwest Argentina, and gifted with plenty of amazing photo opportunities. We will then take the road back towards Salta. En route we will enjoy an outdoor lunch of fresh fish, at Dique La Cienaga. We will still have time to explore the history and culture of Salta, a city rightly nicknamed La Linda, or “the beautiful.” Our final dinner together will celebrate this wonderful region—a place whose spirit you will have captured with your camera, but which will also have painted a glorious picture in your heart. After breakfast around 9am we will part ways. Taxis are available from Villa Vicuna to Martin Miguel de Guemes International Airport. Or you can join us on a post-tour extension!